You can stay in the heart of Midtown and get a good value by choosing the Hotel Wolcott, located on 31st Street off Fifth Avenue and a short walk away from the Empire State Building, Broadway theaters, Rockefeller Center, and other world-famous neighborhood attractions. Each guest room has a private bath, television with pay movies and video games, Internet access (via WebTV), and an in-room safe. All guests are welcome to partake in free coffee and muffins each morning. The hotel also has a fitness center and a business center. Rooms start at $183, double occupancy, for stays in December. “A B&B without the breakfast” is how the East Village Bed and Coffee proprietors describe the establishment. This funky inn, located in the heart of the East Village in lower Manhattan, features 11 private guest rooms (shared baths for all) ranging from $135 to $155 per night, all taxes and fees included, based on double occupancy. Focusing on a communal atmosphere, the innkeepers provide comfy spaces and amenities that each guest can take advantage of, such as fully equipped kitchens with free coffee and tea; lounges with digital cable television, DVD/VCRs, computers and printers; bicycles; and access to the inn’s garden (in season). Free Wi-Fi is also available throughout the building. The property is located on Avenue C between East 7th and 8th streets, and is within easy access of the neighborhood’s restaurants, boutiques, and clubs, as well as numerous public transportation options. Want a stunning skyline view, while staying just a short ride from the city itself? Want a spacious hotel room that would save you hundreds over a comparable room in the city proper? If so, consider a stay at the Westin Jersey City Newport, a waterfront hotel just across the river. The hotel has more than 400 guest rooms, each with flat-screen television sets, as well as luxury bedding and bathrooms. The property also has a fitness center, a pool and whirlpool, a 24-hour business center, a restaurant, and a lounge. The PATH train station is located one block away, offering easy access to Manhattan. Some rooms have skyline views. I found rates from $195 per night, double occupancy, for stays in December. At press time, the hotel was also running promotions for discounted rooms, free-night stays, and park-and-stay packages. The Hotel 414 is a home-away-from-home getaway in the heart of Midtown. Located on West 46th Street, not far from Times Square and Broadway, the hotel is actually two historic townhouses sharing an inner courtyard and garden. Guestrooms feature private baths, high-speed Internet access, flat-screen cable television, and MP3 docking stations. Rooms overlook the property’s courtyard or Restaurant Row (46th Street). Complimentary continental breakfast is served each morning; tea, coffee, and juice are available until midnight each day. Rates start at $190 per night in December, based on double occupancy. Spend a weekend uptown for a fraction of what the stylish neighborhood typically costs by choosing the Hotel Newton. Located on the Upper West Side on Broadway, the Hotel Newton offers easy access to Central Park, Columbus Circle, the American Museum of Natural History, and other famed neighborhood sites. For those wanting to explore the rest of the city, the 96th Street subway is steps away from the hotel. Rooms start at $167 per night if you’re willing to share a bath; private-bath accommodations start at $295. Guestrooms have flat-screen cable televisions, microwaves, refrigerators, and coffeemakers. High-speed Internet access is available for $5 per day. Additionally, guests receive discounted daily access to the New York Sports Club fitness center located across the street ($15/day upon presenting your room key). 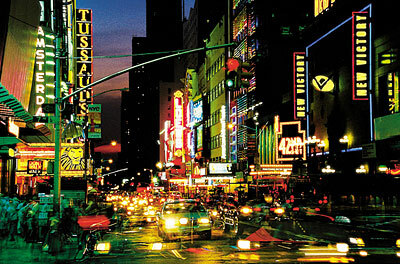 Have you found a good hotel deal in New York City? Tell us about your favorite hotel values by leaving a comment below!